This post is part of a travel diary series about my trip to Hong Kong. To read days one and two, click here. 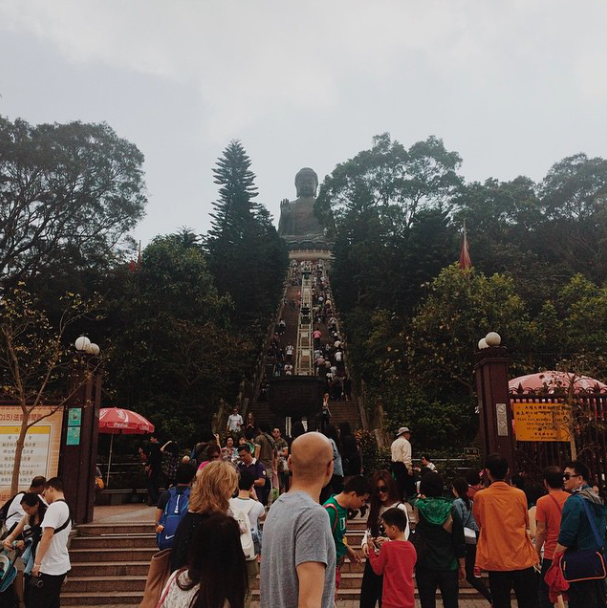 Saturday was devoted to the Tian Tan Buddha, a 112 foot tall statue of Buddha on Hong Kong’s Lantau island. It would be a trek — three trains, then a long cable car — so I left the hotel as early as I could. The sky was still cloudy. I thought I wasn’t afraid of heights until the tiny, glass cable car to the Buddha started to stretch over the water and the mountains. I was nervous, my mind filled with disastrous situations — what if this cable breaks and we fall and die? What would be my last thoughts on earth? The other passengers paid no mind to the height, they took their selfies with their selfie sticks. I took long, deep breaths. The view, though frightening, was beautiful. On one side, a small village of high rises, below, a body of water, and ahead of us, the mountains, and beyond that, the head of Buddha peeking out from the valley. Some people chose the long way there by climbing the steep hills from the center of Lantau. I could see the hikers from the cable car. When they reached a peak, they collapsed on the grass and gave each other high-fives. 45 minutes later we reached the Buddha, the sun had come out. A walked the a small village, climbed the stairs to the Buddha and admired the view. Next door at the Po Lin Monastery, I observed the monks in blue-gray robes passing through the corridors. I stopped at the entrance of the temple to watch people make offerings and pray. I’m such a nervous person who lives too far in the past and thinks too early into the future, I’m the anthesis of Buddha’s teachings — I crave material things, I never focus, and am adamant that karma does not exist. I nodded at Buddha but felt like a fraud. Yours truly at the base of the Buddha. I had dinner at a restaurant in the village, and returned home via cable car. At the hotel, an email from Kent reached my box. He’d gone out the night before, and was going out again to the official Hong Kong Sevens after-party. I was exhausted from the Buddha excursion, and the jet lag, but for the sake of the story I wanted to go. My father lives by this single principle: “Know no strangers.” And I wanted to live by it too. I sulked in bed. Eventually, I slept. It was Palm Sunday, and I’d promised myself that I’d go to mass every Sunday during Lent, even on vacation. I had breakfast and walked through North Point to St. Jude’s church for an English language mass. I was late because I was a little lost, and when I finally reached the church, there was a crowd of 200 women filling the lobby, all holding palm fronds. They were chanting a hymn and waving the palms and smiling. It couldn’t possibly be the noon mass, right? “No, this is it,” a man at the front desk said. Then a priest processed through the crowd, parting them, and went up a flight of stairs to the church. I followed behind them, completely unsure of what was happening. The ferver was unlike anything I’d seen. Very crowded Palm Sunday mass. The church was completely full; standing room only. I got a spot leaning against the back wall but barely fit. Mass was different than anything I had ever experienced. Everyone sang every song (which was projected on the wall behind the priest), everyone was so engaged. I left right after communion feeling liked I’d gone to another world. I took the train from there to Kowloon, for shopping. There is a famous street market known as the “Ladies Market”. Armed with an extra helping of street smarts, I hopped on the train there. Throngs of tourists were at the market stalls, buying purses, fake watches, and souvenirs. The sellers were relentless hagglers. I realized fast that it was a fatal mistake to simply touch something a the store. If that happened, the seller would approach with his or her calculator. And haggle. At one stall, I stopped to look at a bracelet. “You buy, you want?” asked the shop keeper. “No, I don’t really—“ I started to say. “How much you want to pay?” she said. “No,” I said, “I don’t want it.” I turned and left the stall, and then I heard a scream. $50 HKD being the US equivalent of $6. I was shocked. I returned to the stall, bought the bracelet, and laughed. I wanted to explore Soho next, the area where all the expats live. It’s hip and cool and WIlliamsburg-esque. I parked myself in Nosh, with a large latte and watched the people go by. In my journey to Nosh it got warm outside, and the two corner walls of the restaurant were lifted to make it airy and bright. Two women to my left, expats from Connecticut, talked about their new lives in Hong Kong. I learned that a lot of women end up in Hong Kong because their husbands are in finance. I was halfway envious. Part of me wanted to be some well-kept wife, on a little extended vacation in Hong Kong. Coffee break at Nosh, and a post in progress. I knew of a good dim sum spot (good according to the internet, at least) just a few blocks away. I walked in that direction, accidentally passing the Man Mo Temple. Of all the temples I’d seen in Hong Kong, this one was my favorite. The center of the main room was decorated with red lanterns and iron coils. The lights were dim, and the smoke from the incense billowed up over my eyes, making the lanterns seem like a mirage in the darkness. I could have stood there forever. I kept walking and my stomach growled. I had been too chicken to really try authentic Chinese restaurants, but I heard that Ding Ding Dim was great for a dim-sum novice like myself. I settled at a table, and ordered pork buns and shrimp dumplings. For the first time during my trip I felt lonely and depressed at my loneliness. I claim I’m “fiercely independent” — but sometimes I’m not. Sometimes I just want someone to talk to. I went to my hotel and to bed early feeling quite sad.